The seizure occurred on Aug. 9, when CBP officers assigned to the Pharr International Bridge cargo facility encountered a white 1996 Freightliner tractor trailer. After the conveyance was referred for a secondary inspection, CBP officers utilized a non-intrusive imagining (NII) system along with the help of a canine team to locate the narcotics. CBP officers extracted 65 packages of marijuana comingled within a shipment of watermelons. 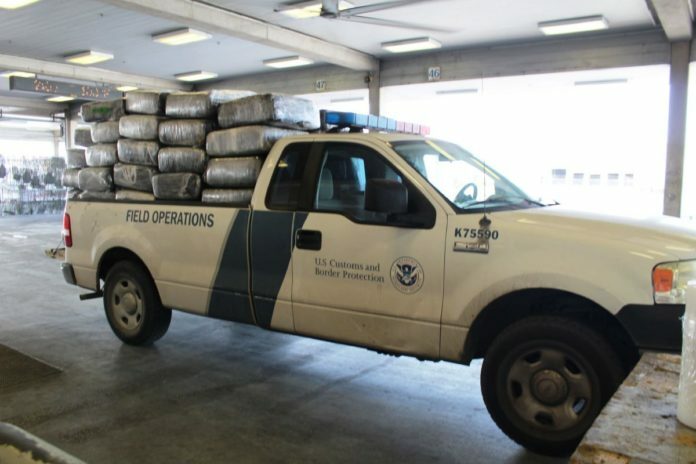 PHARR — A search of a commercial trailer revealed 2,304 pounds of marijuana concealed in a shipment of watermelons this week at the Pharr International Bridge, according to U.S. Customs and Border Protection. “Our officers continue to do an outstanding job in keeping our borders secure, they remain vigilant and committed to halting attempts to smuggle narcotics into the U.S.,” said Port Director Severiano Solis, Hidalgo/Pharr/Anzalduas Ports of Entry. The seizure occurred on Wednesday when CBP officers assigned to the Pharr bridge cargo facility encountered a white 1996 Freightliner tractor trailer. It was referred for a secondary inspection where CBP officers discovered 65 packages of marijuana concealed within a shipment of watermelons. CBP seized the drugs, valued at approximately $460,761.